Kensington Palace from the southeast. overlooks a private garden to the south. 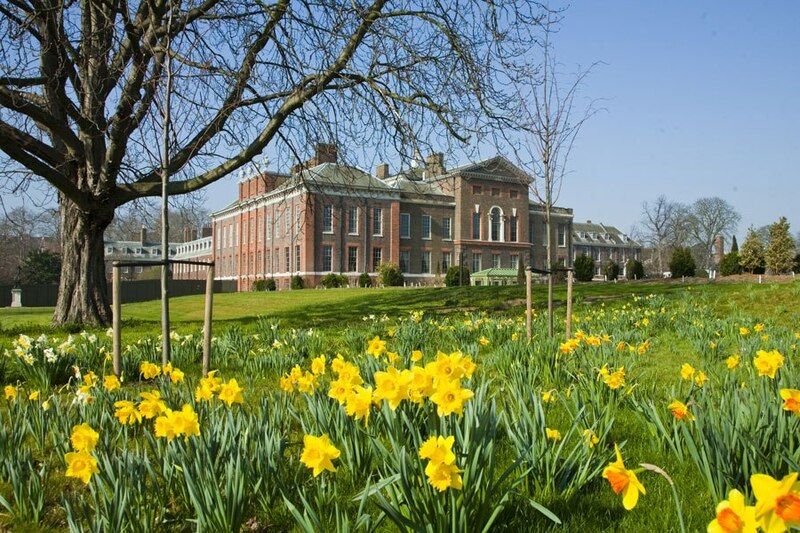 With the anticipation of the birth of an heir to the British throne, an up-grade in accommodations at Kensington Palace was granted William and Catherine, the Duke and Duchess of Cambridge. 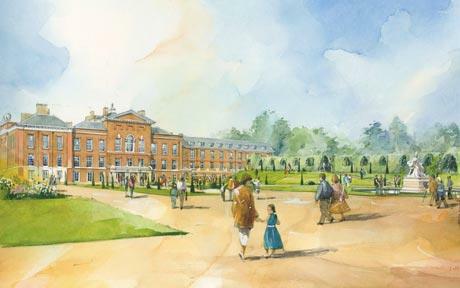 Soon improvements will be complete on the largest of the private apartments at Kensington Palace, No. 1A. This is a reversal of policy from a few years a go that royal residency at Kensington Palace would be phased out. No. 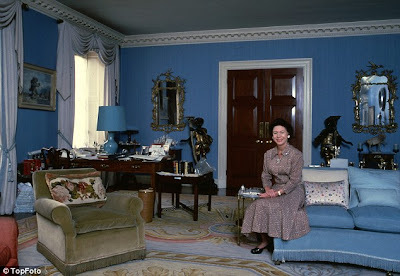 1A was last occupied by Princess Margaret who died in 2002. This is a near repeat of about fifty years ago when the Queen's sister, Princess Margaret, married Antony Armstrong-Jones in 1960 and received a relatively minor apartment in Kensington Palace. But when Margaret informed the Queen of her pregnancy, No. 1A was assigned to the young family. The apartment occupies a section of the clock tower wing designed by Sir Christopher Wren for King William and Queen Mary in the 17th century. It had been occupied by Queen Victoria's daughter, Princess Louise, until her death in 1939, then by Victoria's grandson, the Marquess of Carisbrooke. No. 1A is essentially a four-story attached house, what would be called a terrace house in England. Most sources cite it as having 20 rooms but others list it as having 57 rooms, which seems to be counting the service rooms such as the linen storeroom, the luggage room, a drying room, a pantry just for crystal, and a photographic studio. The entrance to the Clock Court in the 1920s. An 18 month renovation for the Snowdons was provided through an allotment of GBP 85,000 plus a matching amount (largely used for furnishings) from their private income, minus a gift of GBP 20,000 provided by the Queen. 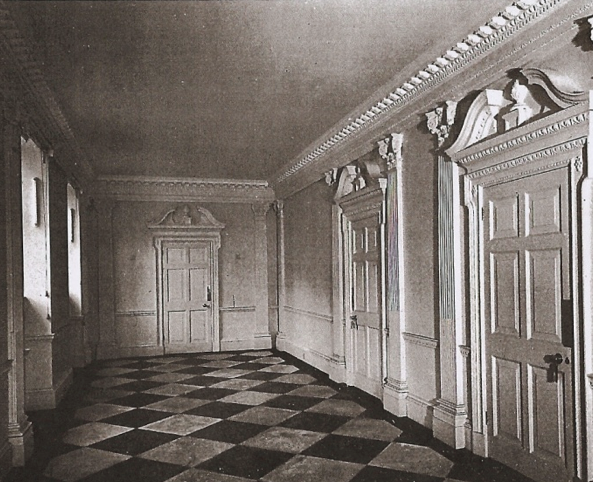 A vintage view of the Entrance Hall of No. 1A. Photo via Royal Dish blog. The main reception rooms are on the ground floor with the Entrance Hall acting as a spine along the inner courtyard, running the entire length of the wing. 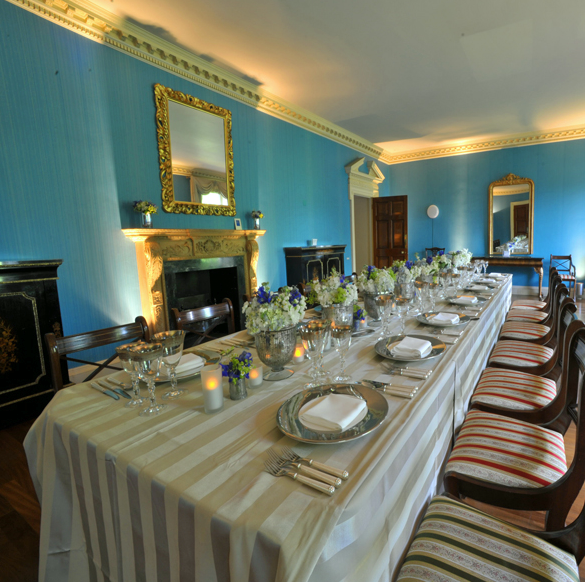 There's an elegant Drawing Room, a Dining Room, a Study used by Lord Snowdon, a Conservatory, and a Guest Cloak Room (which we would call a Powder Room). Apartment No. 1A, Kensington Palace. Photo via Easy Branches blog. Lord Snowdon's uncle, Oliver Messel, advised on the décor, as did Snowdon's lifelong friend, Carl Toms, a set designer. The Regency Style Drawing Room had walls of kingfisher blue with a custom made neo-classical rug designed by Toms. a function after Princess Margaret's occupation. During their courtship, Tony would prepare meals for just the two of them in his rented room and she would clean up afterwards. 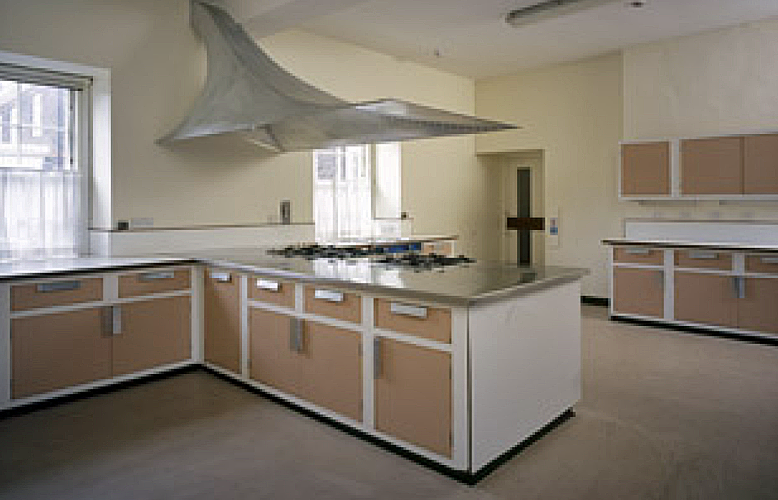 So the concept of a Family Kitchen was an important feature and the first for a royal palace. The Kitchen was 350 square feet with modern cabinets of white and teak-patterned plastic laminate with stainless steel countertops and a sculptural exhaust hood. In addition to a 100 square foot larder, it contained all the modern conveniences of the time: a large refrigerator, a deep freezer, and a garbage disposal. in a photo by Lord Snowdon. 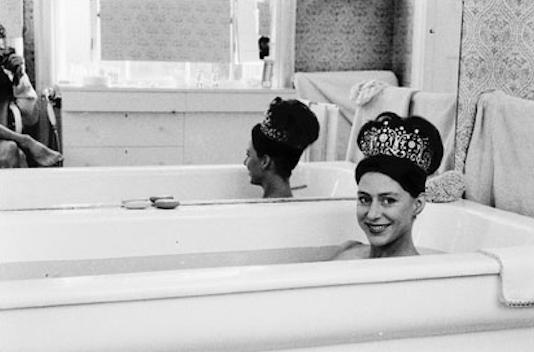 As customary, Princess Margaret and Lord Snowdon each had their own bedroom and bathroom. Hers was fitted with white marble and, as her specific request, an orchid-color sink. 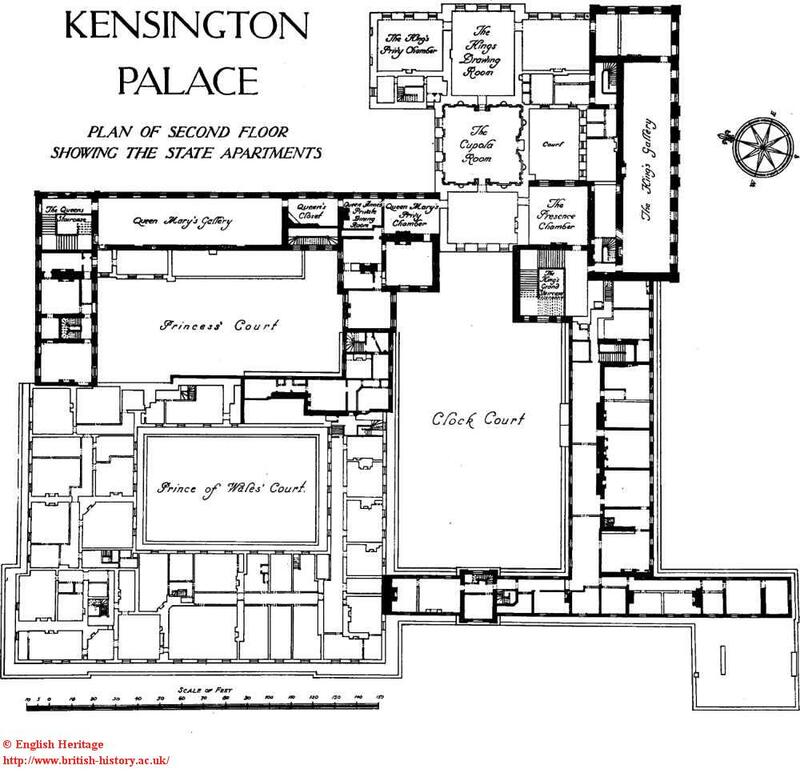 But a departure from tradition was having the rooms for Viscount Linley on the same floor as his parents. 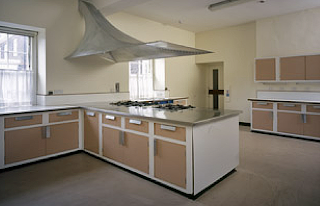 The baby had a night nursery and a day nursery, plus his own kitchen and bathroom. Additionally, there were three more principal bedrooms and dressing rooms, nine staff bedrooms, four staff bathrooms, two staff kitchens, and two staff sittings rooms. 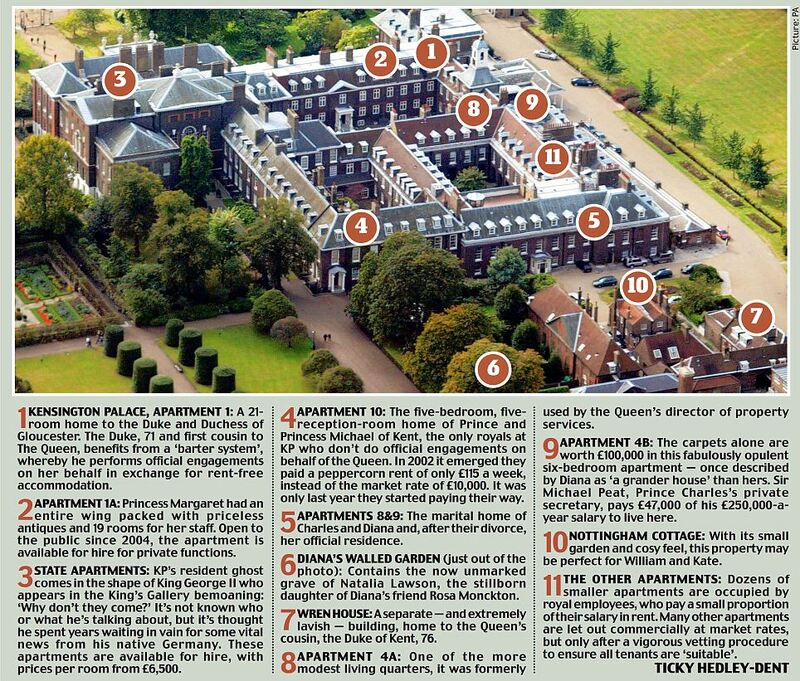 (Apparently the distinction between the staff rooms was due to a hierarchy among the servants). Lord Snowdon, who had studied architecture before becoming a popular photographer, insisted on some modern features such as flush doors and what we in the US would call Danish Modern detailing for his Study; in addition, he wanted some electric devices that did not meet the approval of the Ministry of Works, according to sources. What may or may not have been a coincidence, a fire delayed the Snowdons moving in. 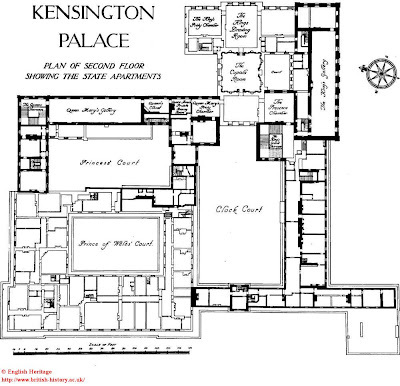 The Third Floor of Kensington Palace. Image via Royal Dish blog. 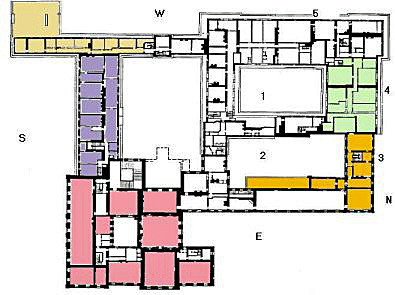 In this color-coded floor plan, the pink rooms are the State Apartment maintained by Historic Royal Palaces that may be visited as a museum. The violet rooms are one of four floors of Apt No. 1A. The tan rooms are Apt 1, now occupied by the Duke and Duchess of Gloucester (Prince Richard); formerly it was the home of his mother, Princess Alice, and the home of Princess Marina before that. The green rooms are Apt 8/9, formerly the apartment of Diana, Princess of Wales; part (or all) of it is now used as The Prince's Drawing School. The golden rooms are the apartment of Prince and Princess Michael of Kent. with the architectural changes not realized. Image via Historic Royal Palaces. The current renovation of No. 1A underway for the Duke and Duchess of Cambridge is reportedly costing approximately $1.52 million. 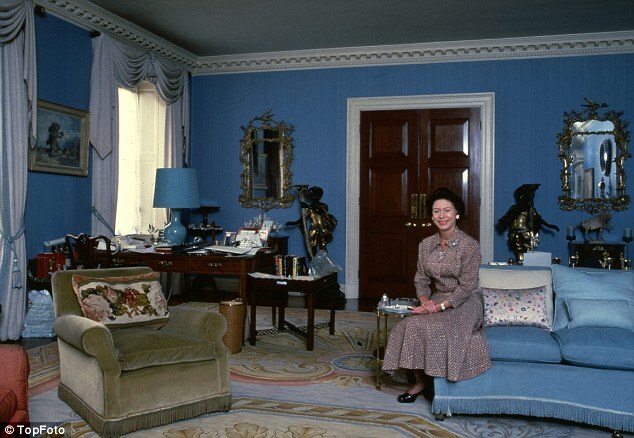 Some news sources are guessing that the interior design is being carried out by antiques dealer & designer Annabel Elliot, the sister of Camilla, the Duchess of Cornwall, William's stepmother. However, the media had seen Catherine shopping at up-scale speciality retail shops for nursery items and there has been speculation that Kelly Hoppen has contributed to that room at least. An alternate new public entrance to Kensington Palace. This design, with a few changes, was built. Image by John Simpson Architects via London Evening Standard. Kensington Palace has also been in the news for the GBP 12 million refurbishment in honor of the Queen's Jubilee. It is unique that it is the only British royal palace where the general public can visit the garden and the ground floor of the State Apartments wing free of charge. 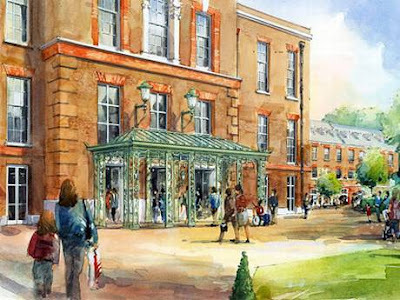 John Simpson Architects, one of Prince Charles' favorites, designed the new ticket court and the new public entrance, the latter being controversial for its design. (After the first design for the entrance was rejected, an alternate that was lower and not attached to the building was submitted as a compromise). A new garden approach was designed by Todd Longstaffe-Gowan. A previous post of The Devoted Classicist about Todd and his work at Kensington Palace may be read here. 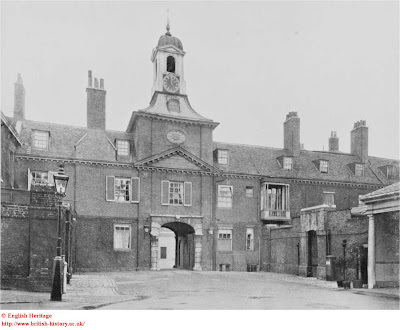 A post on Todd's London home, Malplaquet House, may be read here. 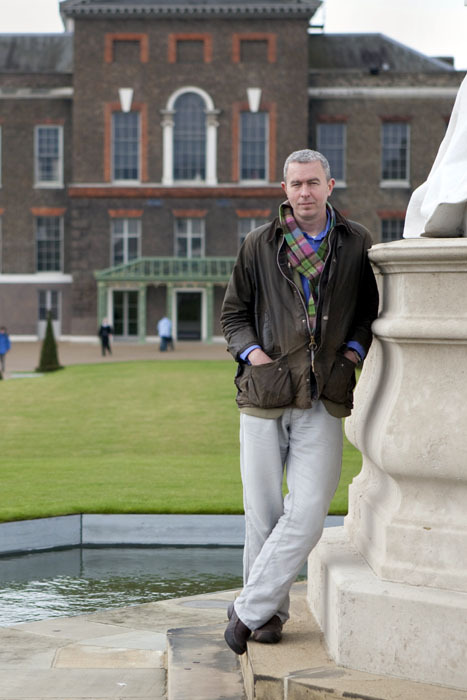 in the garden he designed at Kensington Palace. Perhaps Edward VIII coined its best nickname: "the aunt heap". Thanks for the current update on the residents. Although we probably shan't, it would be nice to see the reincarnation of 1A. The mind boggles at a Kelly Hoppen creation. Columnist, the job of decoration could be a difficult one, straddling the fence between too cheap and too extravagant, fresh without being just trendy and classic without being dowdy. Thanks for commenting. Thomas, I completely missed that auction. Those catalogs are usually a great source for clear photos of items in addition to (generally) accurate descriptions. 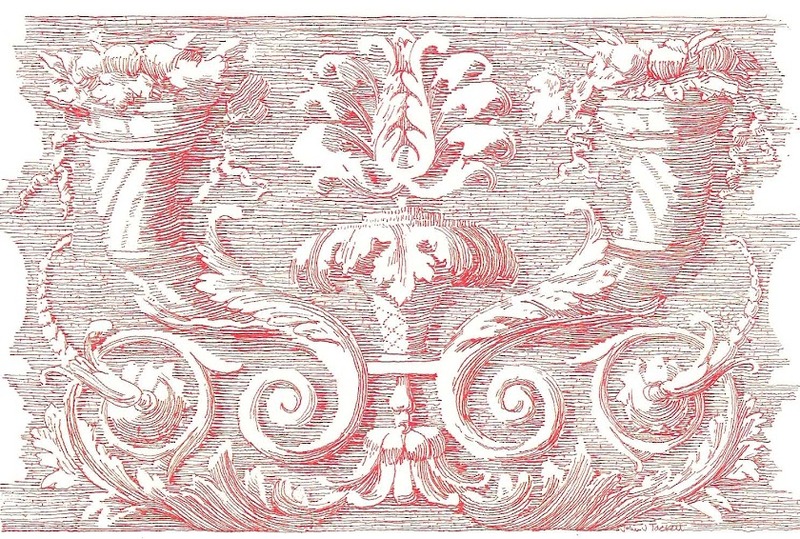 I would have liked to see a better image of that Drawing Room rug, for example. Thanks for commenting. Thomas, perhaps either Viscount Linley or his sister, Lady Sarah Armstrong-Jones, found the rug to be good enough to keep. I really appreciate your checking and reporting back. Many thanks. Love "the aunt heap"! And loved every bit of this post, John, thanks, a great effort. 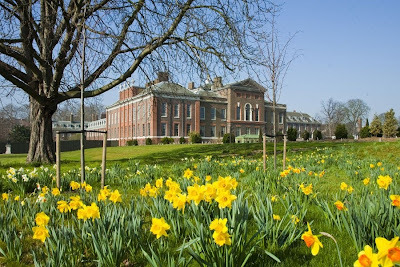 In pre-Diana days Kensington Palace was a delightfully sleepy place to tour. l'oeil reliefs done in bistre and gold leaf. were the two big influences of the day. Bistre! For Devoted Readers who are not already familiar, do take a moment to learn about this color. Thanks, Toby, for all your contributions to this blog; you are greatly appreciated. How cool that the apartment is in the clock tower wing designed by Sir Christopher Wren for King William and Queen Mary. This is one of my favourite periods of British history, even though the architecture was relatively austere. Does the entrance to the Clock Court, that you showed in the 1920s, still look like that today? I wonder what "official duties" I could perform to get those accommodations? FAB post. Jane, if there is not a cushionier for the royal residences, there should be. Thanks for commenting.